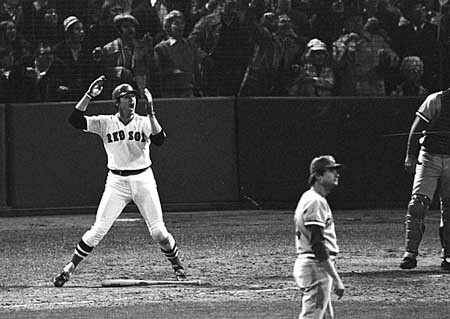 Fisk etched himself permanently into baseball history with a 12th inning game winning home run in game 6 of the 1975 World Series--the game that is often declared the "greatest single World Series game ever played." If you don't remember his body movement urging the ball to stay fair, you're sure to see it on numerous retrospectives. The seven time All Star had an excellent career and was the 12th catcher to be inducted into Baseball's Hall of Fame in 2000, the same year his number 27 was formally retired at Fenway Park.